When formulating a traffic control plan, Roadway Construction Service (RCS) invariably faces numerous challenges. Case in point is the need to develop a system for communicating with motorists, pedestrians, and crews. Temporary pavement markings (TPMs) play a crucial role in the communications process. While not as obvious as flaggers or flashing signs, temporary pavement markings are nevertheless crucial components of an RCS traffic control plan. Which is why we go the extra mile to make sure they’re right. Employed on an as-needed basis, temporary pavement markings are utilized in work zones to re-direct regular traffic flow while construction take place on or near roadways. Typical materials for temporary pavement markings are paint, removable tape, and temporary raised pavement markers (TRPMs). 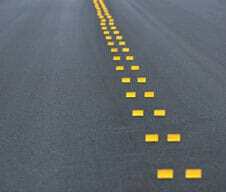 Traffic Paint – Paint is normally utilized for pavement that will be removed or paved over. Among the advantages of this material are versatility, relative low cost, and ease of installation. Tape – Made of plastic with adhesive backing, temporary tape is limited to short-term work zones (maximum of 6 months). It typically incorporates a retro-reflective material to enhance visibility. Temporary Raised Pavement Markers (TRPM) — Attached with an adhesive or peel-and-stick backing, a TRPM may be Tabs (strips of reflective plastic) or Button, which are rounded reflective domes glued to the pavement. Both tabs and buttons often are used to simulate dashed lines. Epoxy and Thermoplastic. The most rugged and durable of temporary pavement markings, these materials are used in long-term work zones. They can last many months and even years. Durability – Air temperature, passing vehicles, weather, and other factors can cause substantial wear and tear to pavement markings. Depending on conditions, the selected material must be strong enough to withstand these elements and last for the duration of the work zone. Cost – Since the cost of temporary pavement markings varies, budget likely will be a factor in determining which material is selected. Weather – If inclement weather is expected, TRPMs are the best choice since they’re the most moisture-resistant of all temporary pavement markings. Paint fares the worst in rainy conditions. Traffic Volume – High traffic roadways undoubtedly will cause abundant wear and tear to markings. All things considered, the best bet for these conditions is epoxy or thermoplastic, as these are the most durable materials. If you’re interested in learning more about temporary pavement markings and why they’re indispensable for an effective traffic control plan, contact RCS for answers to all your questions. You’ll soon discover why we set the standard for traffic planning, as well as all other traffic control services in Orange County, L.A., and all of Southern California.